Vera Wang's bridal collection 2010 is a nod to Cecil Beaton's famous black-and-white Ascot Race scene in My Fair Lady. The collection is accentuated with touches of black and there is even a black wedding dress. Black-and-white weddings are in vogue again, much like their deco-heydays in the 1920s. Black-and-white wedding stationery feels fresh and modern, and elegant and jazzy. 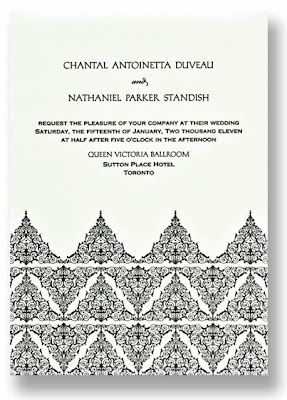 Our Vera Wang Imperial Scroll Letterpress Invitation sets a special wedding style. 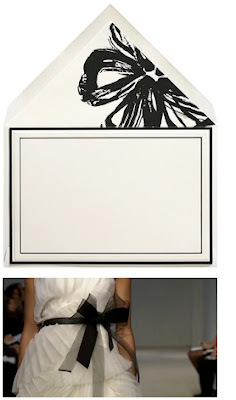 And, our Vera Wang printable card with Bold Calligraphic Flower is elegant as a rehearsal dinner or anniversary party invitation. Read more about Vera Wang's 2010 collection in Departures magazine here.